The Karen Youth Organization (KYO)’s chair Saw Ler Ner has urged more cooperation between ethnic youths in the situation where Burma’s political transition cannot guarantee basic rights of ethnic people. “We are still fighting the battles using the political movement to obtain national equality and self-determination. As we were ruled by the British under the divide and rule [policy], there are opposite views among us. Since the ruling class has been practicing the divide and rule [policy] up to now, conflicts arise from opposite views and we are still unable to overthrown the oppression of a handful of ruling class. That’s why it’s important for ethnic youths to join hands and learn how to find the common enemy,” he said during the ceremony marking the 29th KYO Day on May 23. 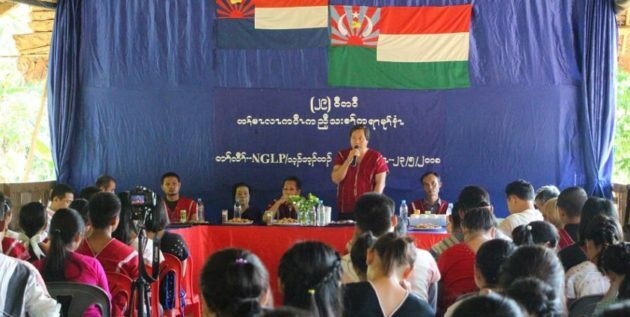 During the ‘KYO Day’ ceremony held in the Karen National Union (KNU) area in Hlaingbwe Township, Hpa-an District, Saw Ler Ner said no guarantee has been given to the ethnic people even though a civilian government has taken office and challenges remain in gathering ethic youths due to restrictions against ethnic people in the peace process, which is being implemented by both sides. In his speech, the KYO chair said the military is strictly upholding the 2008 Constitution and the civilian government does not have full authority despite being granted authority under the constitution and observations are being made on whether the military bureaucratic class can still stand strong. Around 200 participants including some members of the KNU Central Committee including joint secretary (2) Padoh Saw Hla Tun and leaders of the Karen National Liberation Army (KNLA), the Karen Women Organization (KWO), and Karen youths attending the KYO summer short-course attended the 29th KYO Day ceremony. Respective leaders delivered their messages and formal messages from some ethnic youth organizations were read during the ceremony. “Karen youths need to cooperate more for national tasks because we have many weaknesses. So, we, the Karen youths, need to observe our history and what our national leaders are doing and cooperate more while we are studying for our education,” said Naw Sae-Bae Phaw, who attended the ceremony. The KYO was established twice. It was established for the second time at the former KNU headquarters in Manerplaw on May 23, 1989.